Kashmiri Muslims have struggled with caste and religious discrimination for centuries. First discriminated against by Brahmans and then by the so-called upper-caste Muslims who took over them when the majority of Kashmiris converted to Islam around the 13th century. Brahmin chroniclers have called Muslim missionaries (Syeds) and their followers who spread Islam in Kashmir as Mlechchhas, a derogatory term, which means both ‘an outsider’ and ‘a person of lowly birth’. As per T.N. Madan, Muslims were seen as dirty, polluted, unprincipled, omnivorous and lustful. He also says that Kashmiri Pandits would not allow Kashmiri Muslims into their kitchen, even the Muslim barbers and butchers have camped away from the place of rituals until recently. During Hindu rule, Brahmins were nobles and kings played to their whims. After the Hindu rule ended and the era of Sultans began, Sultans had no option but to continue with the same administrative apparatus, as they were alien to land. Even during the rule of Chaks, Mughals, Afghans, Sikhs and Dogras administration continued to be in the hands of Kashmiri Pandits. In between all this, when the Muslims were struggling in general, there were a few groups who were also being discriminated by their very own co-religionists. These people were known as Kameen/lower-caste while the upper caste called themselves Syed/Aseels. Aseels feel that they are superior to any other group. Kameens mostly are those who are involved in menial jobs and are considered the lower-caste. However, Syeds feel that except them all others castes are Kameens. Such is their love for superiority that when Sheikh-ul-Alam/Nund Reshi preached for equality, the Syeds opposed and harassed him, he was even arrested and imprisoned for at least two years. It was Sultan Zain-Ul-Abidin who set him free later on. Reshinamas, again and again, quote incidents of how he was harassed by Syeds during his process of Dawah. Syed Ali Hamdani, Mir Muhammad Hamdani and other prominent religious leaders always used to admonish their Syed followers for discriminating against the local Kashmiri population but their words fell on deaf ears. Syeds even tried to persuade Mir Muhammad Hamdani against visiting Sheikh-ul-Alam as they considered him unworthy of meeting a Syed. The irony is such that those who came to liberate us from discrimination became our oppressors. All prominent saints fought against caste system yet those who claim to be from them hold it supreme. After the Dogra rule was dislodged and India took over, the situation remained unchanged in J&K. Muslim interaction in the administration was still at minimal. Out of the 29 Chief secretaries since 1949, only 9 were Muslims (6 from Kashmir). During the last 102 years, out of the total 34 Police Chiefs in the Muslim Majority J&K, only 2 have been Muslims. Since 1928, Jammu & Kashmir High Court has seen 32 Chief Justices, out of which just 3 were Kashmir Muslims. In 1987, there were only 5 Muslims administrative secretaries. In State Government departments out of 12,323 gazetted officers, only 41.71% were Muslims. The number of Government of India officers in J&K was 1,928 out of which only 133 were Muslims. In the non-gazetted category, Muslims were only 12.98% of the total 5,060. All of these positions, which had been scavenged from Kashmiri Pandits, were mostly taken by upper-caste Kashmiri Muslims. At the top of this are Peers/Syeds (consisting of Qadiris, Muftis, Naqashbandis, Andrabis, Mantaqis, Hamdanis, Masudis, Bukharis, Nazkis, Geelanis, Makhdoomis and so on). Syeds exploited everyone whom they consider below them and maintained their position at the top through treachery, deception and falsehood. 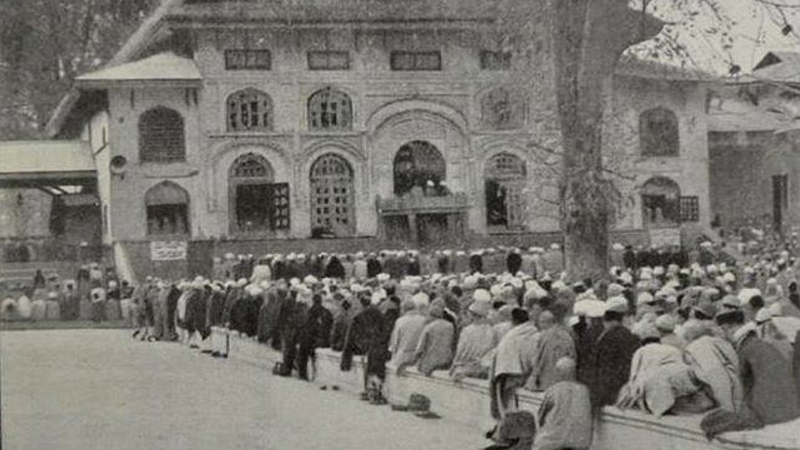 Academics observe that in older days Kashmiris were divided on the basis of their profession or property but since the arrival of Syeds, they are divided on the basis of their religious origin i.e. Muslims of foreign origin & Muslims of local origin. The former holds himself superior to the latter. As per Syeds, they are superior to local Muslims because they are not recent converts and can trace their lineage to the Prophet Muhammad (PBUH), even though there is no concept of Syeds in Islam or the Quran. Many researchers have busted this whole myth of superiority. As per a study done by Harappa Ancestry Project, "If all Syeds really are in direct descent from Hassan and Hussein, we would expect the Y chromosomes of Syeds to be less diverse than those of non-Syeds. Outside the Arab world, we would also expect to find that Syeds share Y chromosomes with Arab populations to a greater extent than they do with their non-Syed geographic neighbours. In this study, we found that the Y chromosomes of self-identified Syeds from India and Pakistan are no less diverse than those non-Syeds from the same regions, suggesting that there is no biological basis to the belief that self-identified Syeds in this part of the world share a recent common ancestry." It further says. "The Syed lineages don't exhibit a "Syed modal haplotype." What you should see is a Syed haplotype of ~50%, and then a range of other lineages which introgressed through people lying about their origins or women being unfaithful to their husbands. Instead there are a wide range of haplotypes. " Many castes were adapted and changed in order to gain social acceptance. As per S.M. Iqbal and K.L. Nirash, Kashmiris were/are in fact fond of nicknames which were/are frequently changed on slight excuses. T.N. Madan also says, ‘Lawrence calls the “social system in Kashmir … delightfully plastic”: … there is nothing to prevent Abdullah, the Doum, from calling himself Abdullah Pandit if he chooses. At first, the people would laugh, but after a time, if Abdullah Pandit prospered, his descendants would exhibit a lengthy pedigree table tracing their family back to one of the petty Rajas, lord of three villages and possessor of a fort, the ruins of which still stand in Abdullah Pandit's village…” (1895: 307). Syeds became the custodians of faith to maintain their hierarchy and still hold a tight grip on all prominent religious and political position in Kashmir. The pro-India parties and resistance camp are both lead and dominated by Syeds, so are almost all of our shrines. The favours of these politicians to their own creed are well known. When Anjuman Nusrat-ul-Islam was formed, its sphere was limited and remained around Srinagar only. Out of 600 contributors to the school, only 20 were from outside Srinagar. The convocations were held in Persian and Urdu, languages of the elites, neither of which were spoken or understood by the lower classes thus widening the gap. These functions were directed at the elites to elicit donations, which included, the Maharaja, grand mufti, big traders, government officials and rich Kashmiri and Punjabi Muslims. Syeds have also earned the title of ‘Malla’ (a derogatory term used for someone who uses religion to earn money through fraud) due to their hierarchal nature. Many sayings like, Mallan kyow dand kalle, malle totie faakai (Malla is hungry even after eating up an ox’s head), Malla deeshith goss parun istigfaar (If you see a Malla, seek forgiveness from God) and Mallaw chhi paanas peth gaanth ti halaal kermecz (Everything is Halal for a Malla) point out to the fact how Kashmiri society has been tortured by the upper caste. A common Kashmiri would build a house for himself; the first person to land his feet in the new house would be a Malla. Whenever a cow gave birth to a young one, the first pot of milk would go to a Malla's house. Any function in the vicinity would be marked by the prior presence of the local Malla. However, as upper castes gave up performative religious practices, local Imams and clerics who dispensed religious roles came to be tagged as Mallas. If oppressing the lower castes wasn’t enough, the upper castes have also stigmatised them to the extent that the Hanjis, Watuls, Chandalas, Pujs, Dombas, Gujjars, Bakarwals, Sheikhs, Chopans, Kraals etc are reluctant to share their surnames publicly fearing ridicule and racist judgment. Various insulting attributes have been attached to them. They are considered mannerless, abusive, characterless and dirty. The upper caste Kashmiri Muslims use these castes to insult each other and admonish their children. As per T.N. Madan, upper caste Kashmiri Muslims would not accept food from Dombas, Watuls and other lower castes. Whenever these lower castes arranged a feast, they engaged professional Muslim cooks who would bring their own cooking and serving utensils. Other Muslims then readily joined such feasts in the houses of these lower-castes but did not eat with them. Lower-castes also used to get invited to the homes of upper-castes Muslims but they were excluded from the general gatherings and were served separately. All this has led to the ghettoization of these communities who now tend to live together with their ‘own’ people. Names like Sheikhpora, Domb-Mohalla, Haenz-Mohalla, Wattal-Mohalla etc can be found all over Kashmir. In Kashmir, it is literally impossible for the upper-castes to get married without the consideration of caste. When confronted with the question about not marrying among common or lower-caste Kashmiris in past, Syeds used to hide behind the excuse of common Kashmiris being less knowledgeable about religion. But as educational standards have improved, the discrimination still persists. "Even the veteran trade union leader and former member of the All Parties Hurriyat Conference general council, Ishtiaq Qadiri, told me one day without the slightest trace of embarrassment that he would not accept an invitation to dine with a milkman’s family", wrote David Devadas in an article. As per a research done on college-going students in Kashmir, students belonging to higher castes have been found to be higher on activity, enthusiastic and assertive personality characteristics, while students belonging to lower castes have been found to possess more of suspicious, depressive and emotional instability characteristics. The possible reason for this could be due to the fact that children from dominant and privileged caste function in an atmosphere of positive social acceptance and expectation whereas children from lower and underprivileged caste are subjected to rejection and operate under a pall of negative social expectations. The ignorant Mohammedan cultivator has not only no one he can call a friend, but everyone, whether Hindu or Mohammedan of any influence is against him. - A. Wingate, Report, Page 56. Over 15 million people in south-Asia claim to have links with the tribe of Prophet Muhammad (PBUH) while the total overall population of the country where Prophet (PBUH) was born is 21 million. How is it possible? Why are our Mirwaizes not chosen on the merit of knowledge but by caste and blood-ties? Is our blood impure or does knowledge only run through a specific caste? How does our top most resistance leader, Syed Ali Shah Geelani have three castes (all of them upper-caste) in his name? Caste system among Muslims is not as vicious as in Hindus but that is no excuse to ignore or downplay it; its existence is very real and should be countered, especially in villages. We don't see violent discrimination as in India where the upper-caste Muslims in many places now refuse to allow lower-caste Muslims to pray with them in the same Mosque or in some case to be buried in the same graveyard, but bias does exist as in inter-caste marriages. And also due to a history of being privileged, upper-caste Muslims have access to better education, employment and security opportunities than rest of the Muslims, so more steps should be taken to help the less fortunate. The young generation of Kashmir must overcome this caste-bias and treat each other as equals. Young Syeds should especially speak up and against it in solidarity with those who have been dehumanized, discouraged and discriminated against. Lacking any political identity lower-caste Kashmiri Muslims need all the help they can get.